Ashley George Hamilton was born on 30 September 1974, in Los Angeles, California USA, to actors George Hamilton and Alana Stewart; singer Rod Stewart is step-father. Hamilton is an actor, singer-songwriter and stand-up comedian, best known for his roles in the films “Beethoven’s 2nd”, “Off Key”, “Iron Man 3” and “Cats Dancing on Jupiter”. So just how rich is Ashley Hamilton at present? According to sources in mid-2016, Hamilton’s net worth reaches $5 million. His wealth has been earned through his involvement in the film and music industries during a career now spanning well over 20 years. Hamilton entered the public eye by marrying actress Shannen Doherty in 1993, when he was only 19 years old. The same year he appeared with the actress on “Saturday Night Live” and in the film “Beethoven’s 2nd”, the sequel to the hit film “Beethoven” of the previous year, making his film debut with the supporting role of Taylor Devereaux. He went on to receive a starring role as Michael in a foreign-made drama film “Lost in Africa” the following year. In 1997 he had a recurring role as Cole Deschanel in the NBC soap opera “Sunset Beach”, but was dropped from the show a month after its premiere. The year 2001 saw Hamilton as Maurice Dupres in the Spanish-British-Italian comedy film “Off Key” starring his father George Hamilton, then appeared as Ben in the indie film “Sluts & Losers” of the same year. Over the next several years he made guest appearances in the television series “Oz” and “Femme Fatales”, and appeared in the TV films “Dreamweaver” and “P Lo’s House”. In 2012 he was cast as Bruce in the indie comedy-drama film “Lost Angeles” and the following year as an Extremis soldier Jack Taggert in the popular film “Iron Man 3”. All contributed to his net worth. Hamilton’s next roles were in the 2014 thriller “Phantom Halo”, and in the short film “Implant” of the same year. In 2015 he was cast as Kurt in the film “Cats Dancing on Jupiter”, and starred in the E! reality documentary television series about his own family, “Stewarts & Hamiltons”. His most recent film appearance has been in the upcoming comedy-drama film “Rules Don’t Apply”. His net worth is still rising. Aside from his acting career, Hamilton is a singer and songwriter. In 2003 he released his single “Wimmin”, co-written with British star Robbie Williams. The song reached #27 on the UK Singles Chart, then the two collaborated on Williams’ 2003 single “Come Undone”. Additionally, Hamilton has collaborated with stars such as Hilary Duff and Scott Weiland. He has recently formed the band “Ashley Hamilton & The Lonely Hearts” and signed with LAVA/Republic Records. In 2007 Hamilton pursued a career as a stand-up comedian, and has since been performing at LA’s comedy clubs such as “Hollywood Improv”, “The Comedy Store” and “Room 5”. His net worth benefited further. In 2009 he appeared as one of the celebrities in the dance competition show “Dancing With the Stars”, and later became a field correspondent in the entertainment news program “Extra”. Although being a member of a famous family, Hamilton’s involvement in the entertainment industry, his career as a singer and songwriter, as well as his comedy acts, have given him the recognition he needed to become the star that he is today in his own right, and have enabled him to establish a considerable personal fortune as well. When it comes to his personal life, Hamilton was married to Shannen Doherty for five months in 1993. In 1996 he married actress Angie Everhart, but that marriage again lasted only a few months. Sources believe he is currently single. Hamilton has gone through some very difficult years in his past, including heroin addiction. He has also struggled with anorexia and bulimia. Fortunately, all that appears to be behind him now. 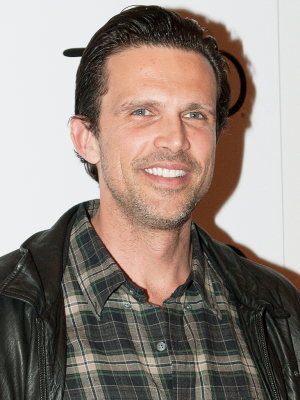 Music Groups "Ashley Hamilton & The Lonely Hearts"
TV Shows "Sunset Beach" (1997), "Oz", "Femme Fatales"; "Dancing With the Stars", "Extra", Comedy clubs: "Hollywood Improv", "The Comedy Store", "Room 5"
1 His marriage to Angie Everhart lasted 86 days, and he was married to Shannen Doherty for 195 days. 2 Older half-brother of Kimberly Stewart and Sean Stewart, his mother's children from her marriage to singer Rod Stewart. 4 He suffered two motorcycle accidents and has had many surgeries as a result. 5 Went in the same school as Angelina Jolie. 6 He has a tattoo covering his left arm. 7 His brief marriage to actress Shannen Doherty is referenced in Mallrats (1995), in which Doherty starred. Ben Affleck's character is named "Shannon Hamilton.". 8 Chosen as one of the 50 most beautiful men in the world of "People Magazine" in 1997 or 1998. 9 He is a music artist and songwriter as well as an actor. Co-wrote the song "Come Undone" with Robbie Williams.Ashley has also written for Hillary Duff and Scott Weiland from stone temple pilots. Ashley also had a song on Ironman 3 soundtrack,as well as having his on top ten hit co wrote with Robbie Willams. 10 Son of actor George Hamilton and actress Alana Stewart.